More safer, more comfortable, more healthy! Welding site is usually messy due to gas hoses and cables that are connected to welding machine. Welding Carrier tidies up the welding site with binding those hoses and cables to its body. 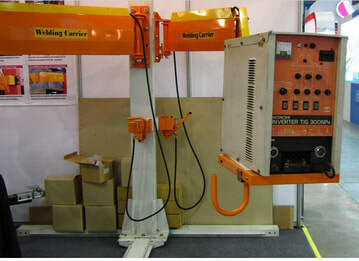 Also, Welding Carrier helps welders to carry them with easy up/down and right/left movement. Welders can avoid the safety hazard. Welding machine is a necessary equipment in a welding environment of steel, stainless and aluminium fabrication manufacturing. Usually welders need to carry welding machine, cables and gas hoses at once when moving to farther or higher welding site. 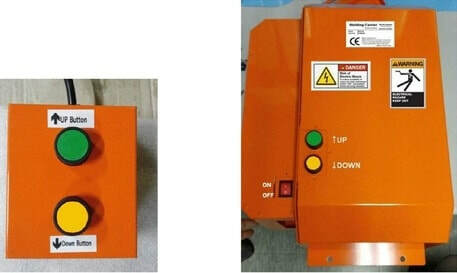 WA-215A is designed for Argon Welding Torch. It has different Installing Plate from other models.